SmartBounce Automatic Bouncer - Chadwick is rated 4.8 out of 5 by 10. The Ingenuity™ SmartBounce Automatic Bouncer™ is the closest second to mom’s arms. Its 2-speed automatic bouncing options are designed to mimic mom’s movements, and the cradling seat offers extra cushion for an extra comfy baby. When your little one needs a fun distraction, the pivoting toy bar and 2 plush toys are ready for your baby’s amusement. 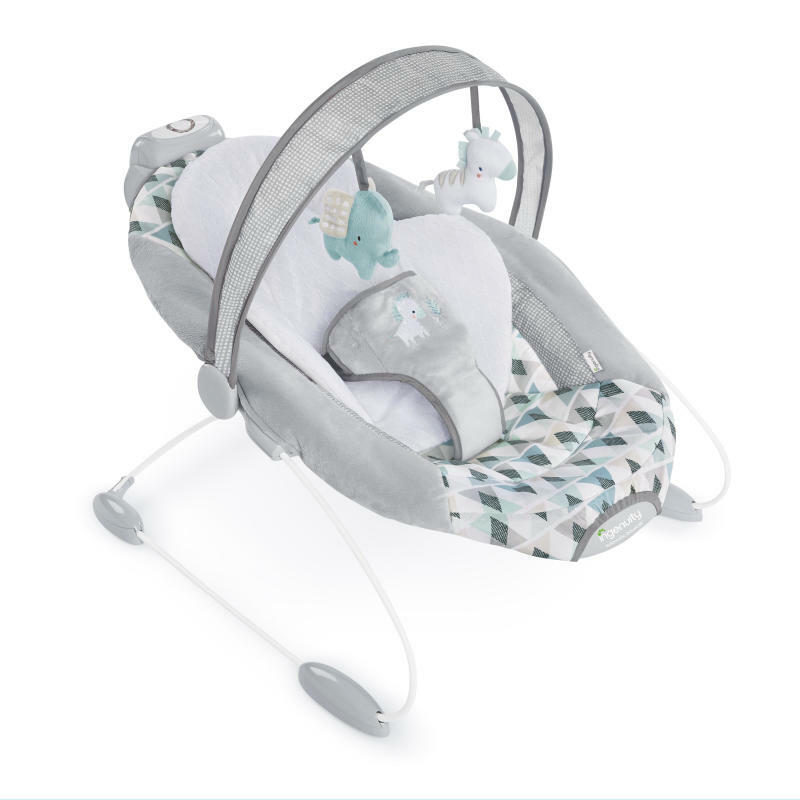 This baby seat even plays 11 comforting melodies and nature sounds that your baby will love. The modern Chadwick fashion is designed with neutral tones that will complement the décor of any home and are perfect for a baby girl or boy. Whenever you need a second set of hands, the Chadwick™ gives your baby a safe and soothing place to watch you tackle your day. Dimension (in) 23" x 19" x 23"
Seat pad and bolster - Machine wash with cold water, gentle cycle.Toy bar and toys – Wipe clean with a damp cloth and mild soap. Air dry. Do not immerse in water.Frame – Wipe the metal frame with soft, clean cloth and mild soap. Rated 5 out of 5 by LadyQ from Great product As all ingenuity products I love the colors. Also the size and weight makes it easy to carry it around with us. It fits smaller spaces so it’s very convenient. The bouncing is gentle, which my baby loves. Some people may prefer a stronger bounce, but we like it as it is. The toys are very cute, baby loves them! And the music is very pleasant. The seat pad is indeed easy to clean which is always a great feature for baby stuff. Overall we love this product and would definitely recommend it. Rated 5 out of 5 by LadyQ from Great product As all ingenuity products I love the colors. Also the size and weight makes it easy to carry it around with us. It fits smaller spaces so it's very convenient. The bouncing is gentle, which my baby loves. Some people may prefer a stronger bounce, but we like it as it is. The toys are very cute, baby loves them! And the music is very pleasant. The seat pad is indeed easy to clean which is always a great feature for baby stuff. Overall we love this product and would definitely recommend it. Rated 5 out of 5 by Tink from Great product! This item is a life saver when I just need an extra set of hands. My baby just loves the seat and the bounce. It's perfect. I only regret she will outgrow it way too fast. If only they stayed little for longer. Rated 5 out of 5 by AnneS from Comfortable and Soothing I love the plush fabrics and automatic bounce feature, which is soothing for baby and leave my hands free. The music and sounds are pleasant, and the recline seems to be at just the right comfort level for an infant. I also like the colors available from Ingenuity; they aren't loud or busy and can go along with pretty much any decor. The only two drawbacks I've encountered? Firstly, the toy bar comes off very easily, especially when I'm moving the bouncer to another location. Also, the toys themselves are just barely in reach for young babies, and can be frustrating for them because they can't actually get their hands around them. It would be nice if the toys dangled a bit lower, or if there were hooks that would allow you to customize the toys yourself. Rated 4 out of 5 by Girlmom from It actually bounces on its own! When my little one decided she preferred a bouncer over her swing, for our sanity we searched high and low to find a new one that would bounce itself without any luck. We were tired of bouncing it since she is only 2 months and cannot do it herself just yet. I was so excited to receive this because it does the trick! The soothing music is a bonus for white noise. It was easy to put together and took me only about 10 minutes. My little one absolutely loves this bouncer and prefers it to any others. She will spend a good amount of time in it too, which allows me to get things done around the house! My only complaint is that the buckle is already too tight and while it’s asjustable the straps are extremely short. She is only 2 months old and cannot wear it because it’s too tight. The plastic buckles are not very smooth and I actually scratched myself on one. Finally, the toy bar does not lock securely in to place. It constantly comes off and I worry it will hit my baby in the face if she pulls on it, but she does love watching the animals, so I have to just supervise her with it. All in all I am pleased with the product, just think there are a few improvements that could be made. Rated 5 out of 5 by Dtamplin from Yes, please! A bouncer that I don't have to manually bounce? Umm yes, please! I'm always on board for a any contraption that makes parenting easier and this is definitely one of those. I would highly recommend this for anyone looking for a bouncer for their baby! Rated 4 out of 5 by Girlmom from It actually bounces on its own! When my little one decided she preferred a bouncer over her swing, for our sanity we searched high and low to find a new one that would bounce itself without any luck. We were tired of bouncing it since she is only 2 months and cannot do it herself just yet. I was so excited to receive this because it does the trick! The soothing music is a bonus for white noise. It was easy to put together and took me only about 10 minutes. My little one absolutely loves this bouncer and prefers it to any others. She will spend a good amount of time in it too, which allows me to get things done around the house! My only complaint is that the buckle is already too tight and while it's asjustable the straps are extremely short. She is only 2 months old and cannot wear it because it's too tight. The plastic buckles are not very smooth and I actually scratched myself on one. Finally, the toy bar does not lock securely in to place. It constantly comes off and I worry it will hit my baby in the face if she pulls on it, but she does love watching the animals, so I have to just supervise her with it. All in all I am pleased with the product, just think there are a few improvements that could be made.